For at least another year, the residents of Evesham and Voorhees townships are going to be hard pressed to justify drinking alcohol at local businesses and then trying to drive home. At a press conference on Sept. 20, Evesham and Voorhees officials announced a one-year extension of the Evesham/Voorhees Saves Lives program. For the past year, the program has offered intoxicated Evesham and Voorhees residents free rides home seven days a week between 9 p.m. and 2 a.m. from 29 alcohol-serving establishments in the two towns. The program uses private transportation companies Uber and BeMyDD, through which geo-location technology on smartphone apps determines whether requests are coming from a participating bar or restaurant. When using apps at those locations, users will see a special option where they qualify for a free ride to their home. When the Uber and BeMyDD drivers meet the residents, the services will only drive the residents to their residential address within Evesham or Voorhees. No taxpayer dollars are used for the program. Instead, it is funded by a special foundation where community members and local businesses can donate money to help pay for the rides, which on average cost only $5 to $10. According to Evesham Mayor Randy Brown, 2,000 people have taken advantage of the program within its first year. Brown said DWI arrests of Evesham and Voorhees residents have decreased significantly since the program was put into place, with an average of just one resident arrested every two months. 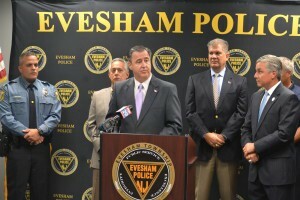 “Our goal of course is to go zero per month, but that to me, it’s a number of which I’m proud to stand to next to the chief (Evesham Police Chief Christopher Chew) and say we have really taken a bite out of our DWIs for our local residents,” Brown said. Chew said stopping DWIs was a top priority for his department, and he was happy to be a part of something such as the Saves Lives program without having to use extra funds by increasing the department’s budget or laying off officers. With the decrease in DWI arrests, Chew said his officers are afforded even more time to patrol and identify individuals who still aren’t taking advantage of the program. “I’m hoping that as a result of the success we’re seeing here just from our two towns’ partnership that other towns look into this program and give their community members an alternative way to get home with taking that risk,” Chew said. Voorhees Mayor Michael Mignogna also praised the program, saying it makes sense for the neighboring townships to work together. Mignogna also said that while the most important aspect of the program is to save lives, the program also has the added benefit of encouraging Evesham and Voorhees residents to visit businesses in each town. “It helps to generate business in both of our townships, so we’re pleased to be a part of it, we’re pleased to be extending it, and we’re looking to this being a very long partnership,” Mignogna said. Brown, a Republican, also praised being able to work with Mignogna, a Democrat, on a program that benefits all residents. “This program right here is local government at its best,” Brown said.